An entertainer's dream home located in the heart of paso robles wine country! Extraordinary indoor and outdoor living spaces are set among the 116± acres, this exquisite estate offers 4,200± sq. Ft. Of living space, 4 bedrooms and 4 bathrooms, a great room with a wood burning fireplace, wet bar with wine cooler, living room and library with a fireplace, an ideal chef’s country kitchen, a large window seat area, and a large covered front porch. There is an attached 2 bedroom, 1 bath apartment with its own entrance, an attached 3 car garage and a detached carport with solar panels. The well-kept grounds features grassy lawns, fenced in ground pool with a slide, fire pit, a grotto with a waterfall, covered outdoor terrace and a private spa that sit on the balcony off an upstairs bedroom and much more! 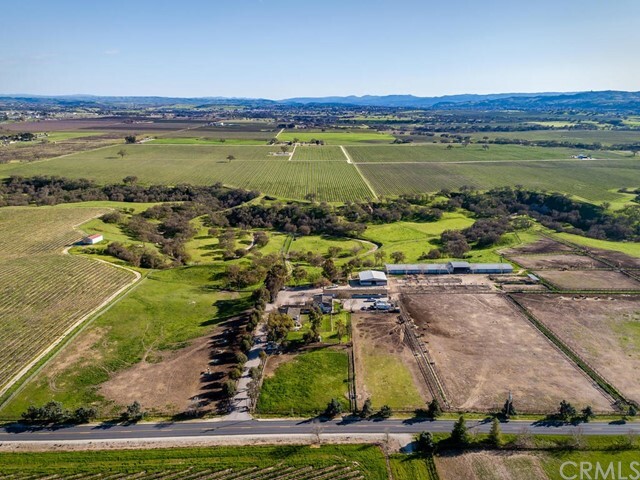 Additional amenities include a batting cage, workshop, rental home, caretaker’s home, metal barn, a deer fenced garden with irrigated raised beds, an expandable chicken house, a seasonal pond, irrigated vineyard of table grapes and fruit trees. There is a 26± acre leased vineyard of cabernet sauvignon and syrah. Sophisticated & quality finishes throughout make this property not to be missed. Stunning views from every angle of this premier custom built home sitting on top of expansive rolling hills. Located in the exclusive gated community of cass estates, the main house is roughly 5500 +/- sq ft and built to the highest quality with an emphasis on natural light, captivating views and enjoying the outdoors. 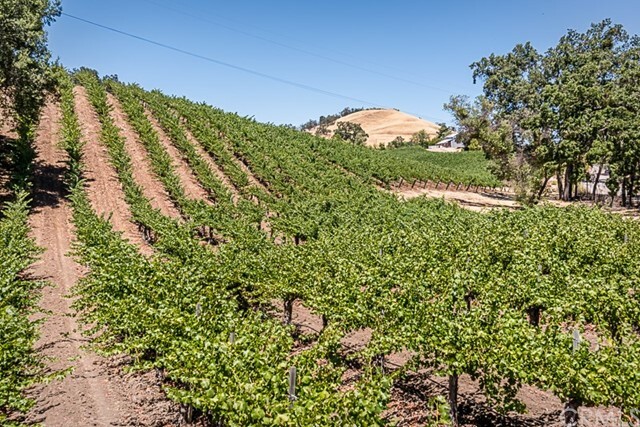 Over 55 acres provides plenty of agricultural uses including horses and vineyards. Watch the sunset from the front porch while overlooking the vineyards with a glass of wine from one of the neighboring award winning wineries. The entertainers kitchen has abundant light, top of the line appliances including a 48” wolf range and 48” subzero fridge, two dishwashers and granite countertops. There are 7 zones of hydronic heating keeping the floors and home a comfortable temperature year round while reducing traditional heating costs and 36 solar panels to further offset the energy use. The master suite has a gas fireplace and opens up to the master bath with a solid cast iron soaking tub. Enjoy outdoor entertainment to the fullest with the elegant 25’x40’ pool, bocce ball court, horse shoes and endless views. The back yard was designed using the natural terrain to provide a wind break and privacy. The 600 sq ft pool house and/or guest house has a full kitchen and a bathroom. This property finds the perfect balance of large acreage and incredible views while still providing nearly 20 usable acres for your enjoyment. See the attached list of amenities. Welcome to oak hill farms! A private electric gate entrance takes you to this 45 acre horse property! Beautiful and well maintained thoroughbred horse breeding/foaling farm. This parcel consists of two ranch style homes. The main home is a ranch style 2 b/2 b with fireplace and office and the other is a 3b/1b ranch style guest house. There is an ag well and a domestic well, two septics and 3 phase power. Appx 34 horse stall barn with bathroom, lab room and office. 16 paddocks, foaling stalls, holding pens, stallion pens, arena and appx 10 fenced off pastures. Additional features: pole barn, hay storage barn and tack rooms. Perfect for boarding, breeding, training and riding horses. The property has a total of 3 barns with appx 24 holding pens. Minutes from the paso robles airport and downtown amenities. This 45 acres is a one of a kind picturesque and tranquil horse farm that is a must see to fully appreciate all that it offers! All data, including all measurements and calculations of area, is obtained from various sources and has not been, and will not be, verified by broker or mls. All information should be independently reviewed and verified for accuracy. Absolutely stunning 5 acre property in the spanish camp neighborhood. Sits high on a grassy knoll over looking pastures and greenbelt. 3,200+ sqft main home offering 4 bedrooms 3 bathrooms and 850sqft permitted guest house with 1 large bedroom (upstairs), 2 bathrooms, laundry room and large kitchen. Home is on solar leased with sunrun and electricity has been payed up front for next 20+/-years a huge savings in bills! Opportunity to make a little sweat equity here. The house has been partially remodeled not much needs to be finished cosmetically. There is some deferred maintenance outside/inside. However, easily could be most gorgeous entertainers delight with pool/spa. Private electric gated entry and fenced for animals. Three car garage w/ circular driveway. This home will be a show stopper with a little tlc! Homes like these do not come up often. This is one not to be missed!! $25,000 price reduction on this quiet wine country oasis with permitted guest home on 2. 5 usable acres - located minutes from paso robles, slo, and scenic coast. The property is on the creston wine trail with nearby vineyards, and tasting rooms. The large main residence features 4 bedrooms, 2 baths, large island kitchen with nook, formal living room, formal dining area, and family room with fireplace. Don't miss the elegant master suite with double door entry, walk in closet, exterior french door to private patio & garden. Master bath includes double sinks, soaking tub, separate shower, and garden window. Large laundry/utility opens out to an over sized three car garage. Custom window coverings, skylights, central hvac, whole house fan, 3-car garage, and workshop w/220. Both homes have newer soft water systems & reverse osmosis. The permitted guest home features an open living room, kitchenette, 1 bedroom/1 bath, shower, and separate laundry. Private yard, patio, and gardens tucked away from the main residence. Guest home includes wood floors, skylight, central hvac, ceiling fans, tank less water heater, & pet door. Perfect for guests, or vacation rental use. No cc&r's. Peaceful, private, park like setting complete with burn pit, mature trees, redwoods, chinese maples, roses, grapes, hedges, arbors, walkways, sitting areas, patios, fountain entry, professional landscaping all on timers. A full acre is piped with waterlines for horses or agricultural use. Welcome home! Listing Agent: William Nelson Listing Office: Realty One, Inc.